By 1450, the skyline of Florence was dominated by Brunelleschi’s dome. Although Brunelleschi had created a new model for church architecture based on the Renaissance’s pervasive philosophy, Humanism, no equivalent existed for private dwellings. 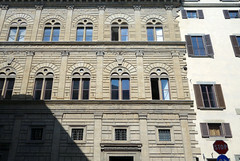 In 1446, Leon Battista Alberti, whose texts On Painting and On Architecture established the guidelines for the creation of paintings and buildings that would be followed for centuries, designed a façade that was truly divorced from the medieval style, and could finally be considered quintessentially Renaissance: the Palazzo Rucellai. 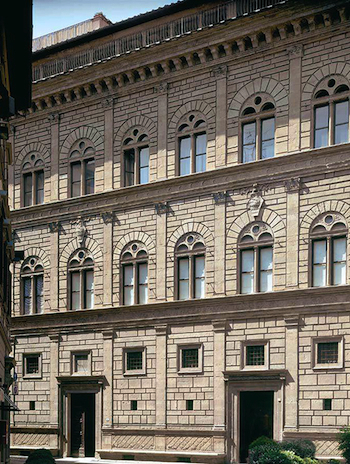 Alberti constructed the façade of the Palazzo over a period of five years, from 1446-1451; the home was just one of many important commissions that Alberti completed for the Rucellais—a wealthy merchant family. 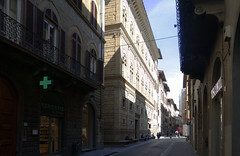 Like traditional Florentine palazzi, the façade is divided into three tiers. But Alberti divided these with the horizontal entablatures that run across the facade (an entablature is the horizontal space above columns or pliasters). The first tier grounds the building, giving it a sense of strength. This is achieved by the use of cross-hatched, or rusticated stone that runs across the very bottom of the building, as well as large stone blocks, square windows, and portals of post and lintel construction in place of arches. 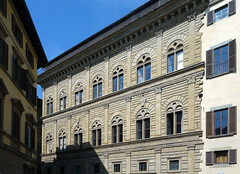 The overall horizontality of this façade is called “trabeated” architecture, which Alberti thought was most fitting for the homes of nobility. Each tier also decreases in height from the bottom to top. On each tier, Alberti used pilasters, or flattened engaged columns, to visually support the entablature. On the first tier, they are of the Tuscan order. On the second and third tiers, Alberti used smaller stones to give the feeling of lightness, which is enhanced by the rounded arches of the windows, a typically Roman feature. Both of these tiers also have pilasters, although on the second tier they are of the Ionic order, and on the third they are Corinthian. The building is also wrapped by benches that served, as they do now, to provide rest for weary visitors to Florence. 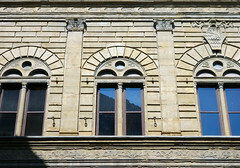 The Palazzo Rucellai actually had four floors: the first was where the family conducted their business; the second floor, or piano nobile, was where they received guests; the third floor contained the family’s private apartments; and a hidden fourth floor, which had few windows and is invisible from the street, was where the servants lived. 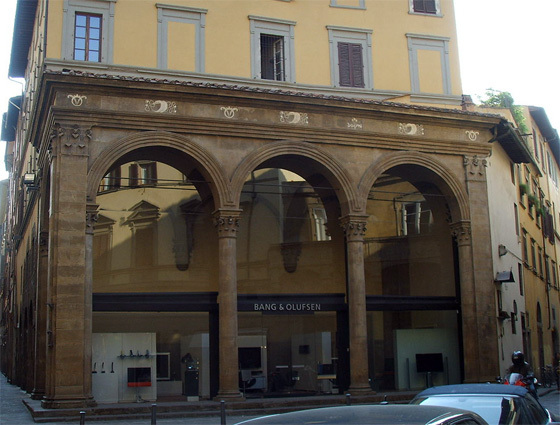 In addition to the façade, Alberti may have also designed an adjacent loggia (a covered colonnaded space) where festivities were held. The loggia may have been specifically built for an extravagant 1461 wedding that joined the Rucellai and Medici families. It repeats the motif of the pilasters and arches found on the top two tiers of the palazzo. 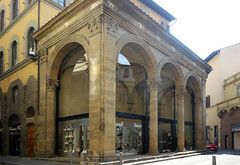 The loggia joins the building at an irregularly placed, not central, courtyard, which was probably based on Brunelleschi‘s Ospedale degli Innocenti. In many ways, this building is very similar to the Colosseum, which Alberti saw in Rome during his travels in the 1430s. The great Roman amphitheater is also divided into tiers. More importantly, it uses architectural features for decorative purposes rather than structural support; like the engaged columns on the Colosseum, the pilasters on the façade of the Rucellai do nothing to actually hold the building up. Also, on both of these buildings, the order of the columns changes, going from least to most decorative as they acend from the lowest to highest tier. 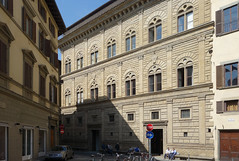 The Palazzo Rucellai has many features in common with the Palazzo Medici (below), which was constructed a few years before, not far from Alberti’s building. 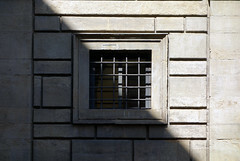 The Palazzo Medici is also divided into three horizontal planes that decrease in heaviness from bottom to top. But there are subtle differences that betray the intents of the patrons. 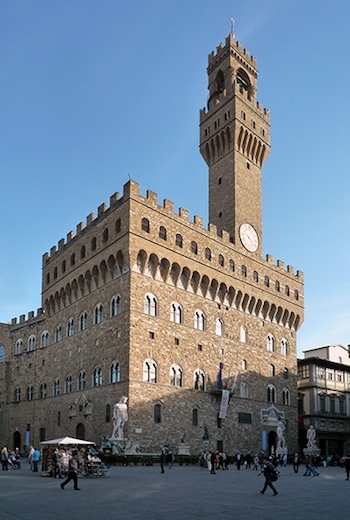 The bottom tier of the Palazzo Medici, built for Cosimo il Vecchio de’ Medici by Michelozzo, resembles the stone of the Palazzo Vecchio (left), the seat of political power of Florence, with which Cosimo intentionally wanted to associate himself. It also employs the same type of windows. Because Michelozzo used this medieval building as a model, whereas Alberti looked to ancient Rome, the Palazzo Medici is not truly Humanist in its conception and lacks the geometric proportion, grace, and order of the Palazzo Rucellai. 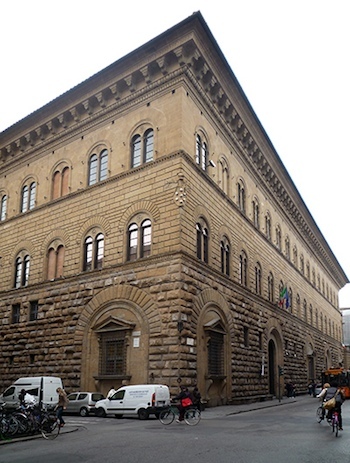 The top tier of the Palazzo Medici is almost entirely plain, whereas Alberti continued to use architectural features for ornamentation throughout his design. The main difference between the Palazzo Rucellai and other palazzi was Alberti’s reliance on ancient Rome. This may have reflected Giovanni Rucellai’s pretensions for his family. Rome was the seat of the papacy, and though Rucellai was not a cleric, he claimed to have descended from a Templar. 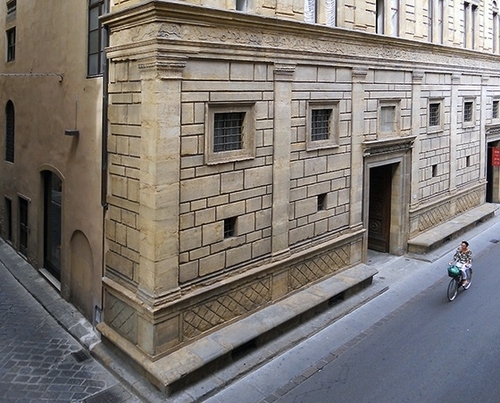 The Palazzo Rucellai went on to influence the design for the homes of many clerics, such as the famous Palazzo Piccolomini that was built for Pope Pius II in Pienza by Bernardo Rossellino. Cite this page as: Christine Zappella, "Leon Battista Alberti, Palazzo Rucellai," in Smarthistory, August 9, 2015, accessed April 24, 2019, https://smarthistory.org/alberti-palazzo-rucellai/.